So, without a list, this morning, I simply asked him. "Hey, Fejj!!! Are you going to Pro-Tec Pool Party 2011? Yes or not???" The Q&A stuff is short, but that’s worth much more than a nice bullion from Fort Knox. That’s his answers. Jeff Hedges Tuck Knee Invert on the big pipe at Lake Cunningham. Photo Steve Potwin. Jeff Hedges: Hi Xavier! I am being allowed to enter the qualifier for the Pro-Tec Pool Party 2011, on Thursday the 19th. Not sure who all is entering that, but supposedly they will take 8 old guys from the qualifier, and put them in with the 20 pre-qualified people from last year (top 18 places from last year, plus 2 'wild cards'? not sure who those are...) I just want to do it for fun, don't care where I place, but would like to skate as good as I can. isTia: So, are you invited in the Master's section? Jeff Hedges: I got an invite to enter the qualifier event on Thursday before the main event on Saturday. I've heard there should be 16 old guys like me, trying for 8 additional spots in the Geriatric division of the Protec Pool Party on Saturday. isTia: How often do you train? Jeff Hedges: Train? It may just be semantics, but I don't think of 'training' or 'practice' when I go skate. I do it because it’s just so damn fun. I love it, but I am hungry to relearn some of the stuff I used to do and learn new things I never did before. I ride at least once a week, and often 2. Sometimes even 3 or 4 days... When I'm fortunate enough to get to do so. Jeff Hedges at Lake Cunnigham. Soon at a Pro-Tec Pool Party 2010 near you. Photo Steve Potwin. isTia: Where do you skate? isTia: What's the highlight of this year since the last Pro-Tec 2010? Jeff Hedges: Last year I went to the Combi contest as a spectator, having only recently gotten back on board on a regular/weekly basis. Since then I entered a couple local contests at Lake Cunningham. 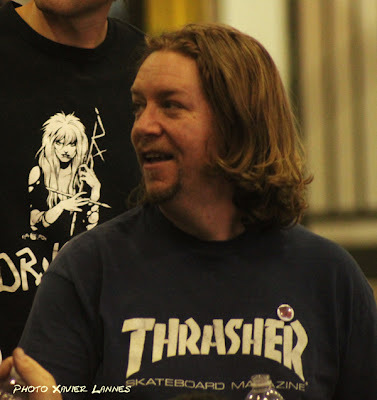 The judges placed me 4th at the Tim Brauch contest there (far exceeding any expectation I had). I also went to the Quicksilver all 80's Day jam in Florida (placing 7th) and to the Vert Attack 5 in Malmo Sweden (5th), so it’s been a surreal year, skating a lot and entering contests like I was a kid again. isTia: Is it watching the last Protec that you decided to re-skate? 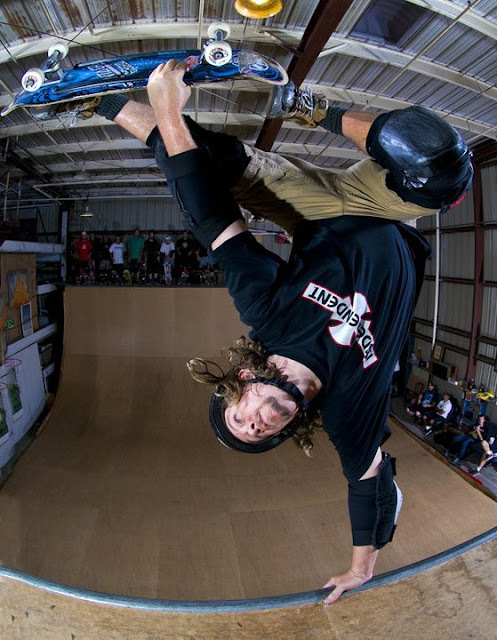 Jeff Hedges: Sadplant at an indoor ramp close to his house. isTia: Who are you skating with those days? Jeff Hedges: A great crew of guys from all over the SF Bay Area. My buds Dan, Troy and Brandon, Jason, Greg, Griff, Mitch, Mike P, J Haley, Pat Black, Kyle Mac, Brad McClain, Brent Jon and Chico crew used to come out a lot, a ton of guys over the last year+, and of course the extremely supportive and motivational Steve Cab. Thanks for keeping the fire going guys! isTia: What's your favorite bowl? 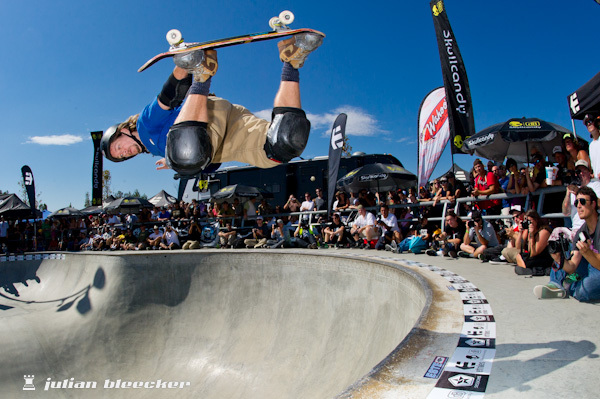 Jeff Hedges: The Combi and Bucky's are the two best pools I have ever skated. Period. Love the Skull bowl at Lake Cunningham as well. isTia: Are you pro? Sponsored? Looking for a sponsor? Don't care about sponsorship? Just skate for fun? isTia: What's your daytime job? Jeff Hedges: Looking for a job. Anyone interested in hiring a very experienced (16 years testing) software/website/game tester? How about any jobs for an old skater? isTia: How long did you stop skating? Jeff Hedges: I never said the word "quit" but when all the vert disappeared and the job and family took precedence, I later discovered I could no longer ride vert when I finally got the chance... so the last time I rode big stuff was around 20 years ago. 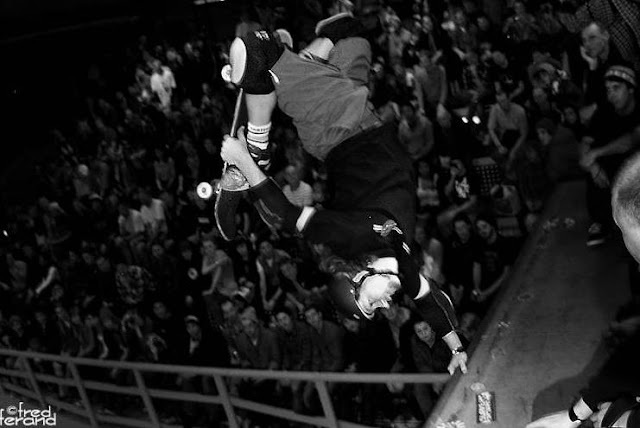 Jeff Hedges, Inverted Tuck Knee at Malmo, Sweeden. Not bad for someone that has been "sucking at skateboarding for the past 15 years". - until December of 2009 when I 'found' Greg's vert ramp and the great crew there. Over the last 15 years up until the last year+, I would try riding some small stuff only a few times a year... Not surprisingly I sucked at it. isTia: How does it feel to be back? Jeff Hedges: "Don't call it a comeback" :) It feels great to be skating every week again. I don't know how I let myself believe I was too old, so for anyone else out there that has lost a lot of years to work and life, know this - it is possible to relearn much of what you once did, and at the very least have fun trying. Jeff Hedges: Just get out there and ride - nothing else that comes close to the feeling. I want to thank my family: Cindy, Cullen, Christopher and my little boy Logan. Thanks also to my friends Troy Sliter, Dan Kuhns, Brandon Fields, Jason Richardson, and Cab, for all their help, encouragement and support, and to all the locals in the Bay Area scene, as well as Christian Cooper at Concrete Disciples, and all my old skateboarding peers for access to skate their spots and for their kind words. Good friends and family support make the skating all the more fun and rewarding. Thanks to Fred Ferand, Steve Potwin and Julian Bleecker for the pictures. All pictures are copyrighted by the authors and used by special permission.